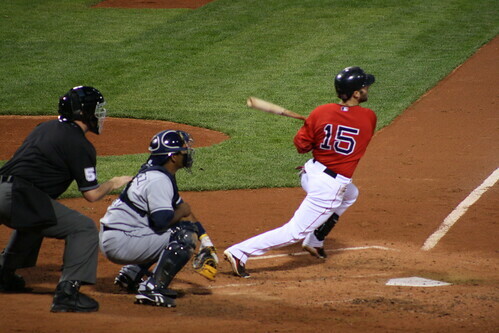 Dustin Pedroia and the Truly, Awesomely, Fearsomely Epic At-Bat - Cursed To First - Sox and Pats forever. It was the bottom of the fifth inning. The Red Sox trailed 2-1 against Angels righty Jered Weaver, who came into tonight's game among the league's top pitchers with a record of 6-0, and looking for a record-setting seventh win in a row to start a season. "Well," I Tweeted sarcastically. "The opposing team has now scored two runs, and therefore has an insurmountable lead." That's really how it has begun to feel, lately, with all the RISP problems making timely hits, let alone runs, hard to come by. Even when first Carl Crawford, and then Jason Varitek and Jacoby Ellsbury reached base (this last on a fielder's choice) -- even, in other words, with Dustin Pedroia coming up and two of the game's fastest runners on the basepaths, there was nary a chicken being counted by me. No way I would've predicted just what would follow next, anyway. Pitch 1 of this Pedroia at-bat in the fifth inning was a 79 mph changeup, called a ball, up high. On pitch No. 2, he caught a 79-mph slider thrown just a little high and wide of center with the tip of his bat, swinging awkwardly, staggering forward to watch it hurtle up toward the State Street Pavilion. Pitch 3, a 93 mph 4-seam fastball, was called a ball, outside. This is where Weaver seems to have really buckled down and become dead serious about getting Pedroia out. On the next three pitches, he pounded the zone, trying a changeup and two more four-seam fastballs, Pitch 4 just slightly higher than Pitch 3, Pitch 5 a just slightly lower, Pitch 6 right on the black low and away, sending Pedroia diving over the plate to just barely snag it. Pitch 7, a cutter, was called a ball up high, and in the midst of all this, the all-but-forgotten Jacoby Ellsbury stole second. With the count full and two of the game's elite baserunners now in scoring position, the Fenway crowd was on its feet -- but this at-bat was still only a little more than halfway over. Pitch 8, a slider low and away, was fouled off. Pitch 9, ditto. Pitch 10, double ditto, except this one hit Pedroia in his already-befouled left foot, dropping him to his knees in the batter's box. Somewhere around this time, Terry Francona was shown in the dugout unwrapping a brand new bright pink piece of Bazooka Joe, no doubt preparing his special dip-and-bubblegum concoction, known for its power to entice the ladies as well as its ability to bring luck during tense at bats where the MVP of your team fouls another ball off the same foot that knocked him out for half of last year, fer the luvva Pete. On Pitch 11, high and outside, Pedroia again fouled it off. Pitch 12, even further outside, was lower this time. Another foul. And then finally, on the thirteenth pitch of the at-bat, Weaver threw a high four-seamer, just slightly inside, which Pedroia clipped with his bat just over the top, putting a spin on the grounder that bounded back past the pitcher's mound and into center field, while the two fleet-footed runners scored the tying and go-ahead runs, and Pedroia ran to first base fist-pumping and yelling like they'd just won the goddamn World Series, and you know what? In that second, it kind of felt like it. Just a little. There was to be plenty more to come in this game, including and especially a cathartic six-run seventh inning that finally saw the Sox lineup explode out of its shell, Big Papi's first Fenway home run, and what we are assured is to be the first of many bases-clearing wallballs for Adrian Gonzalez. But that, right there, that at-bat where Pedroia wore down Weaver, imposed his will upon the field, and landed the true backbreaking blow against the opposition? That was your whole ball game -- in so many different ways. HT on pitch types, location info, calls and timing to Herald, ESPN, Saberseminar, and NESN's replay of every pitch of The Immaculate Plate Appearance on Extra Innings. Video of the hit and its immediate aftermath can also be found here, and the pitch-by-pitch recap of the at-bat is here. I live for these at-bats. That's why Alex Cora's my "esoteric baseball geek favorite". Pedroia, who learned some from Cora, seems to have the same baseball intelligence (whatever that catch-all term means) but he's way more talented offense-wise. Pitch 12 was HUGE! Still don't know how he got his bat on that ball. Probably was ball 4, but he stayed alive and we all know what happened then.